S.F. Lighthouse is Creating Opportunities While Enchanted Hills Camp Rises from the Ashes – Meet Will Butler – Tactile Maps Anyone? It was an honor to meet up with Will Butler, the Communications Director of the San Francisco Lighthouse for the Blind and Visually Impaired. Will gives us an update on the Enchanted Hills Camp located in Napa and people are returning and continuing the tradition that started over 6 decades ago. Jeff talks about the wood working classes he will be teaching along side of George Wurtzel and Brian Buhrow for beginers and a second session for advance wood workers. Scott Blanks gives us a review of the Tactile Maps and how they can provide added information when mind mapping one’s location. The Lighthouse of SF will soon make it possible to order your maps on-line. Will tells us how to subscribe and find out more about theSan Francisco Lighthouse for the Blind and visually Impairedand Enchanted Hills Camp. Welcome to the Blind Abilities coverage of the 2018 National Federation of the Blind convention, sponsored by Aira. Aira, your life, your schedule, right now. 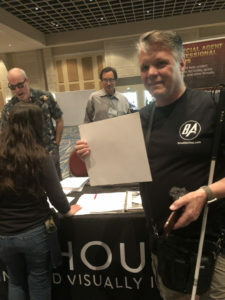 In this coverage of the National Federation of the Blind 2018 Orlando, Florida, I meet up with a virtual friend of mine. I’ve conversed with him many times. His name is Will Butler. He’s the Communications Director at the San Francisco LightHouse for the Blind and Visually Impaired. Such a great opportunity at these conventions to meet up with people you’ve only virtually met. I was really honored to be able to finally meet up with Will Butler and talk about the San Francisco LightHouse, the opportunities and events that they’ve created out in San Francisco not only for California but people worldwide. I also met up with Scott Blanks, and he gave a little description of the TMAPS that they were giving away at the convention. Aira, a description of life. Welcome to Blind Abilities, I’m Jeff Thompson. I’m down here in Orlando, Florida Convention 2018 and I came across the San Francisco LightHouse for the Blind and Visually Impaired booth. And I ran into Will Butler and he’s the Communications Director. How you doing, Will? Excellent, how you doing, Jeff? Finally face to face with the great Jeff Thompson. I don’t know about the great part but I’m here and it’s really exciting to be here. It’s really hot down here. Well, you got to wear a sweater inside because you’re going to freeze inside. Oh yeah. Well in the northern part of California it doesn’t really get this hot right? Every year it’s hotter and hotter up there. But where it really gets hot is out in Napa. Yes up on Veeder Mountain where the Enchanted Hills camp part of San Francisco LightHouse is. That’s right, yeah. We have our camp out there in the hills of the Wine country and it’s, gosh, I don’t know in its 68th year I think. And it almost was its last year earlier this fall because the fires that came through Northern California came and ripped through the area and tore down about half of our camp, including all the cabins where the kids stay every year. So we are just barely recovered from that and we’re lucky enough to be able to launch a camp season again for June. Yeah. The doors are open up there. They are, they are indeed and there are a lot of blind kids and families who are really happy about that because they didn’t want to miss a year. Some people haven’t missed a year in generations. Oh, that’s awesome. All the way from Africa. There’s people coming from Poland, people from Australia are volunteering up there. I hear you’re going to spend a couple of weeks up there. Playing some music, running some power tools. You’re a pretty hands on guy, huh? I worked at Blind Incorporated when I went there as a student they gave me a click ruler and I was able to figure it out. It all came back to me so fast that they hired me to teach it and from there on it’s just been fun to do stuff that people really didn’t expect me to do. What do you think about maps? Maps? That’s what you guys got here, right? Yeah. Do you want to see what we got here at the table? Here, come on over. Okay so what we got here what we’re showing off at the convention in particular this year is TMAP. And TMAP are our Tactile Map Automated Production. One of the big things we do at LightHouse in the map lab is we make maps for people to order. Like someone would say, “I need a map of my neighborhood, I need a map of my whatever.” And we’ll turn it into a tactile graphic that they can feel and use to get around. But we figured that’s not really super scalable because it’s just our time and resources. So we created software that actually allows you to type an address in and print with an embosser auto print a tactile map on demand. Yeah. In some ways if you have access to an embosser it’s like the Google Maps experience to be able to like just type an address in and get an aerial view of the area around your point of interest. And really get to know an area by exploring rather than turn by turn directions. Well, I remember when I first lost some eyesight and I was trying to draw these mental maps. I always wanted something that I could put my finger on and actually get an idea of what the big picture looks like. Yeah. Yeah, well I don’t know, do you want a map of your neighborhood? They’re free. So this is something that you offer all in San Francisco as well? Yeah and actually pretty soon you’re going to be buy these on demand maps from us. You’ll be able to just go on the LightHouse website, type your address in and we’ll send you a map wherever you want. That’s really great. I was feeling these yesterday. I found Market Street on San Francisco on that you are here button. It was really good. So what else has San Francisco LightHouse offer to people in California? Well wait, I shouldn’t say California because I’ve been out there three years in a row and I’m from Minnesota. Right, exactly. Yeah we definitely love the idea that people are starting to come from all over the country and all over the world to take advantage of the services that we offer and the fun programs that we have. We’ve got these dorm style short term residences now in our San Francisco building, which house 29 people at a time. And they’re actually quite nice dorms. They’re better than your college dorm for sure. And so people can come out and for immersion classes and week long retreats and what not. And really stay with us and kind of get immersed in whatever the program is. So we offer employment immersions for youth ages 16 to 24 every summer. The youth stay with us for three weeks and they get job experience in the community, in the San Francisco area. They get to go to work for a few days out of the week. They have workshops, and then culminates with a conference all together. They really get to bond over that over a period of a few weeks. And then we have also similar youth employment programming throughout the year for anyone in the Bay area or anyone who can make it out on the weekends. And people can get that newsletter from the LightHouse. I get one once a week maybe. Yeah, absolutely. Yeah we affectionately call it LightHouse Lately where we just update folks on what’s been going on. It’s usually about four things every week. It is about our programs but it’s also about things that I think would appeal to people globally in the blindness community. It’s where we might give you the latest update about the Holman prize. It’s where we might talk about new initiatives or accessibility related. Advancements that have been made, or projects that we’ve worked on. We worked on a project recently with Microsoft called Soundscape which was a really cool app that helps blind people navigate just with sound and 3D beacons. And the Holman prize, we’re about to announce the winners of the Holman prize next week. I know I’m excited. I watched the countdown. You had the I believe it was 50 and then down to the 10 plus the one. That’s right so we have three winners just like last year. Yeah let’s go over there and listen to that embosser. Scott:she was really well prepared. What are we printing over here? Alright. Well thanks Jeff for getting us on. We are just finishing a TMAP. Street map for someone here at the table. I’m not going to give you the whole address. This is a free giveaway that we’re doing here at the convention basically is just a tactile street map. What we sell in our San Francisco store, and stop me if Will’s already covered this, is a package that includes three scales of the address that you request. And not just tactile but also print. So we want to make sure that everyone has an opportunity to benefit from these maps. So you’ll get those three scales, the key and an intro page that gives you a simple description of what you are about to lay your hands on or your eyes. Describe what the embosser just spat out for you and what you’re doing? Yeah, so the embosser is a tractor-fed embosser. And what we have is two pages. The first page is a map with the address at the top, the streets, and abbreviations at the edge of the map. And then the second page is the map key which gives you the abbreviation, the full street name and the directionality so east/west, north/south, northeast/southwest, etc. And so then I’m just going to staple it up and hand it over to the lucky person who requested it and they’ll have a little piece of their world unlocked and maybe grab a little more independence because of it. How long did it take you to print that? Oh, from the time we got the address to the finished product that was maybe three minutes. We mean it. On demand is the real thing. If people want to find out more about San Francisco LightHouse for the Blind and Visually Impaired out there in California how would they get a hold of you? Yeah, obviously you can just type LightHouse on Facebook and we’re one of the first ones that comes up. There are other LightHouses around the country but we’re the one in the Bay area. You can find Enchanted Hills Camp on Facebook. They have a very active camp related Facebook page. And you can go to our website at lighthouse-sf.org. Lighthouse-sf.org and explore everything there. If you want to learn more about TMAPs you can go to lighthousesf.org/tmap. If you want to just go directly to subscribe for our newsletter you can go to lighthouse-sf.org/subscribe. Alright. We’ve been talking to Will Butler he is the Communications Director out at San Francisco LightHouse for the Blind and Visually Impaired San Francisco. Thank you very much for taking the time. Thank you Jeff, it’s always be a dream of mine to be on your podcast. I appreciate it. Thank you. While waiting for my map I had to ask the embosser, what kind of embosser are you using? The one we brought today that’s a ViewPlus Columbia. So you must be pretty confident that you would bring it to the convention. Yeah that’s exactly why we brought it. We’ve been doing this grind for a while. The last few conferences we’re actually doing swell papers so we were bringing PIAFs and Zychems, but those things are fragile. They don’t like to travel, they don’t like to be handled on the road. They break. So we tried this instead. They’re inexpensive, seems to be reliable, just cranking them out. Back at the shop we’re actually using a ViewPlus EmFuse which is pretty esoteric because it does the ink print as well as the braille. But those are really big units. You’re not going to want to pack that up in a road case and bring it on tour. This one seems like something that you could move around a little bit. Oh yeah, they’re light, they’re small. It’s designed for the home pretty much. Alright Jeff, I have your map for you. Aira, independence like never before.